I love reading. However, sometimes I get so lost in a book that I end up procrastinating on other things. Studying is one of those things that I end up putting off. Fortunately, reading has been linked to improved test scores. Therefore, reading could actually help prepare for the Praxis test. Why is this? Here is how reading can help your Praxis score. On the reading portion of the Praxis Core, you’re expected to identify the main ideas, supporting details, tone, purpose, and more. After picking up your reading material of choice, practice identifying these elements to increase your reading comprehension. You don’t have to read a novel. Instead, practice by reading a news article, textbook, essay, or whatever else you enjoy reading. One of the biggest issues that Praxis test takers struggle with is focusing on the reading material. They get stressed about the exam and anxious to get through the material. Then, before they know it, they’ve completed the reading passage but can’t remember what it’s about. Rather than having to waste time re-reading the passage, practice focusing on your reading material. Work to grasp the overall message or tone after reading it through the first time. On top of remembering what you’re reading, you need to understand what you’re reading. What do you do when you stumble over an unknown word? How do you go about decoding it? Practice using context clues as you read, so unknown words won’t trip you up on the exam. Refrain from reading aloud or in your head. Use your finger as a guide so you don’t lose your place. Move away from the reading material to expand your vision of the page. 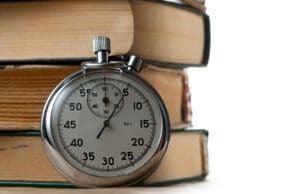 Focus on reading as fast as you can at first. Then, slowly try to increase your reading comprehension while speed reading. Limit eye or head movement as you read. Purchase speed reading software to help you practice. These are just some of the ways of how reading can help your Praxis score. As you enjoy a good book or an interesting article, practice these valuable skills needed to improve your score and pass the Praxis exam. Why Can’t I Pass the Praxis Core Exam?